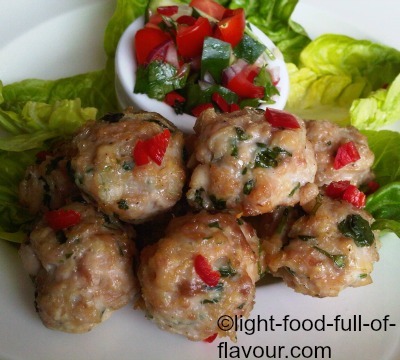 You can serve these utterly moreish Vietnamese chicken meatballs as a starter, as part of a buffet or as canapés - on a spoon or on little gem salad leaves. You can also top them with a little bit of sweet chilli sauce – but don’t drown them in it as they are so tasty on their own. I serve them with a cucumber, tomato and chilli salsa which has a sharp, fresh taste and add zing to the chicken meatballs. It’s a really light and tasty combination! I cook them in some raw coconut oil/butter – in an oven-proof dish in the oven. Coconut oil/butter is the healthiest type of fat to cook your food in. The fat in coconut oil is what’s called short-chain saturated fat, unlike butter which is a long-chain saturated fat. I buy it at a health-food shop and use it when I’m cooking Asian-style food. If you haven’t got any coconut oil, simply place the chicken balls on an oven-tray lined with baking parchment and cook in the oven. 1. Preheat the oven to 200C/fan 180C/400F/gas mark 6. Pulse the chicken thighs in a food processor until minced. 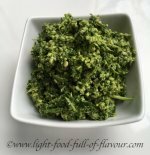 Transfer the mince to a bowl and add the chopped shallots, crushed garlic, grated ginger, chopped lemon grass, honey, fish sauce and chopped coriander. Season with black pepper and mix thoroughly. 2. With your hands, shape the mix into little balls – you should be able to make 28- 30. Add the coconut oil/butter to an oven-proof dish (if it’s solid, place the dish in the oven until it has melted). Add the chicken meatballs and cook in the oven for 15-17 minutes – turning them over mid-way through. 3. While they are cooking, mix together the ingredients for the salad dressing. Place the cucumber, tomatoes, onion, chilli and coriander in a bowl. Add all of the dressing and mix together.